We are currently perched half way up a mountain writing this blog overlooking the Dades Gorge. We are staying in the car park of a Riad where we get to use the facilities of the hotel but sleep in our motorhome. After posting the last blog we trundled off to bed for a few hours shut-eye before the local shouty man wakes us up at about 5:30. No sooner had our heads hit the pillow then a fagot of drummers burst into life. Not only that, they were accompanied by a singing entourage that can best be described as a football crowd. This un-tuned melee went on till about midnight apparently to entertain a ‘package tour’ of French motorhomers’ touring Morocco. On waking, by the shouty man, we packed up as quick as could and headed off into town for breakfast. The rubbish and flies at the campsite were just too much to handle for us sensitive souls. As a trained Surveyor who once made maps for a living one would think one would have a quick glance to see what was ahead regarding today’s journey. But the delivery of some honey covered Msemmens put paid to that. The plan was to head to Ouarzazate and rest up for two or three days before moving on. We planned to take in the Atlas film studios, the Ksur and have a bit of a wander around. Unfortunately two things put the kibosh on the plan. So what looked like a forty-five minute bash up a main road in reality took 2 hours of adrenaline pumping, buttock clenching orifice dribbling mayhem. One of the great things about driving here in Morocco is noticing the amount of gaps in the barriers where some poor soul has misjudged a bend and gone to meet his maker. The concerning thing is not knowing the frequency of barrier replacement but after some of the manoeuvres we saw on our trip we think probably daily. Unfortunately for our viewers most of the action took place behind us and we don’t have a camera pointing that way. We ended up in Ouarzazate just after lunch at the film studios and decided nuts to this and headed for a campsite out of town for a bit of peace. We chose a campsite just off the road to Boumalne Dades for the night. At first our suspicions were aroused as we were the only van in the campsite. We then remembered we had not seen a camper all day, apart from the rally support teams. It seems most of the motorhomers in Morocco either stay at the coast or head inland a weeny bit to Tafraout and that is it. We pitched up, plugged in and had a quick go-around our surroundings and fine surroundings they were. 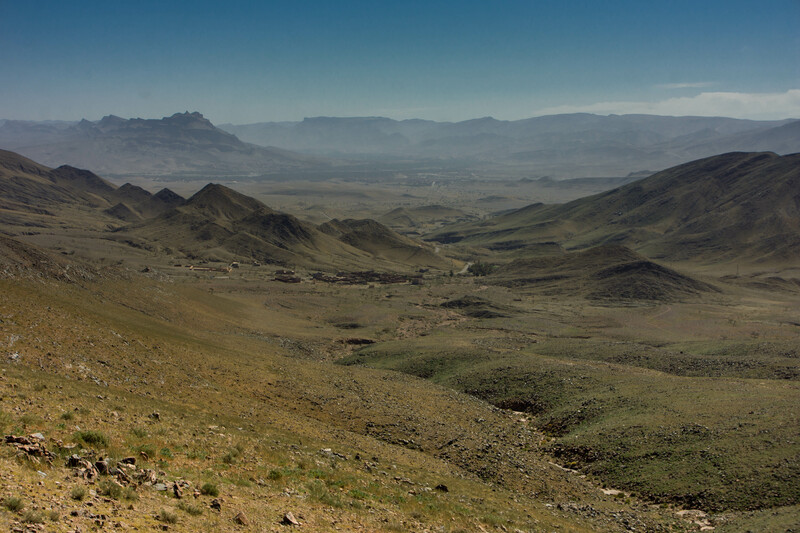 We were in the middle of a Palmerias with views to the snow-capped Atlas Mountains to the North and a swollen river ebbing and flowing to the South. The campsite was everything the one Agdz was not; Clean, well laid out, quiet. Perfect. If there was a quibble then the home-made, firewood driven showers were not entirely what the doctor ordered. Now the food ordered was something else. Spicy rich Harira soup followed by a succulent Chicken Tagine and fresh fruit to finish. I’m salivating now thinking about it. As we do not want you to miss out here is a recipe for you. And you will love it and we loved staying here with an extremely hospitable family. The Harira is very easy to make but has many ingredients. I would suggest to prepare all the ingredients and organize them before starting to cook. There are 3 main steps for making the harira: in step 1 you cook the meat and the legumes. I am using lentils and chickpeas. However, as I am using canned chickpeas, I will add them to the soup at the end. If you use dried chickpeas, let them soak in water overnight, and cook them with the meat in step 1. In step 2, we add the tomato mixture. Finally, in step 3 thicken the soup with flour. On medium heat, drizzle 1 tablespoon of vegetable oil in your pot. Add the grated onion, diced meat, and spices (salt, pepper, ground ginger, turmeric powder, pinch of saffron threads, and cinnamon stick). Add 1/2 cup of lentils and add 1 litre (4 cups) of water. Boil some water and place the tomatoes in boiling water for 1 minutes. Remove the tomatoes from the water, let them cool down, peel them, and slice them. Cut 1/2 celery stick in small cubes. In a food processor, mix the tomatoes and celery, until you get a smooth mixture. coriander and parsley to the soup. Dilute 1/4 cup of all-purpose flour in some water. Mix very well until all the flour is dissolved. At the end, beat an egg with a fork, then add it to the soup while continuously stirring the soup. Cook for another 3 minutes before serving! Here are some pictures of the packed campsite complete with swimming pool. You can just see the snow capped mountains. A strange feeling when we are lolling around in swimming pants. After a wholesome breakfast we packed up and headed for the publicly assessable Kasbah next door. We hired the services of a very excitable young guide who enthusiastically showed us around with such vigour I thought he was in danger of swallowing his entire head. However I will now go to my grave knowing they were built for climate and security. For those of you who want more click here kasbah. Sign of the times. If you google Kasbah the number one hit is the Kasbah Nightclub Coventry. I know which Kasbah I would prefer to go to. 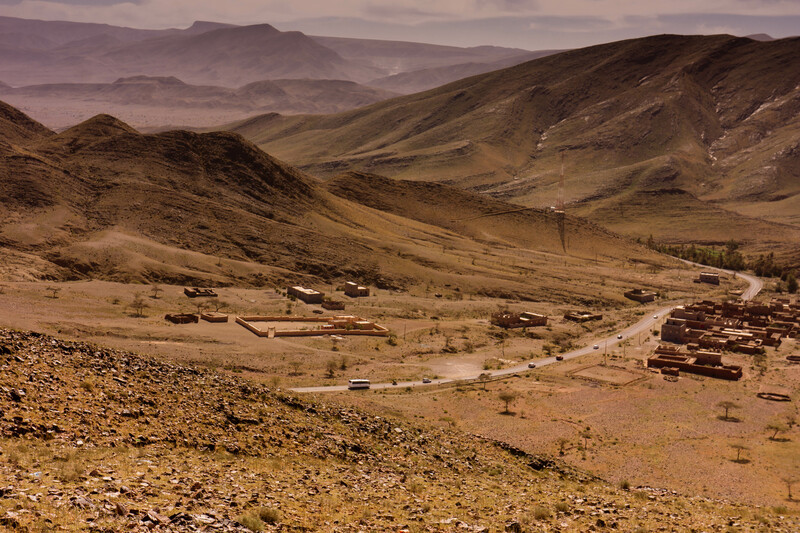 The drive to Dades from Skoura is mostly through Moroccan urban sprawl. Yes there is always the backdrop of the mountains to both sides but the bit in front of you is not that great. I did manage to take a picture of the Grand Canyon on the way. See here. But don’t be fooled as they are only a couple of metres high. We aimed to stay in a campsite in Boumalne Dades for the night. A campsite described on the internet as an Oasis of calm. Well it is not. It is a building site at the end of a track in the middle of nowhere. So we picked up some bread and headed 10 Klicks up the valley to our mountain top Shangri-La. 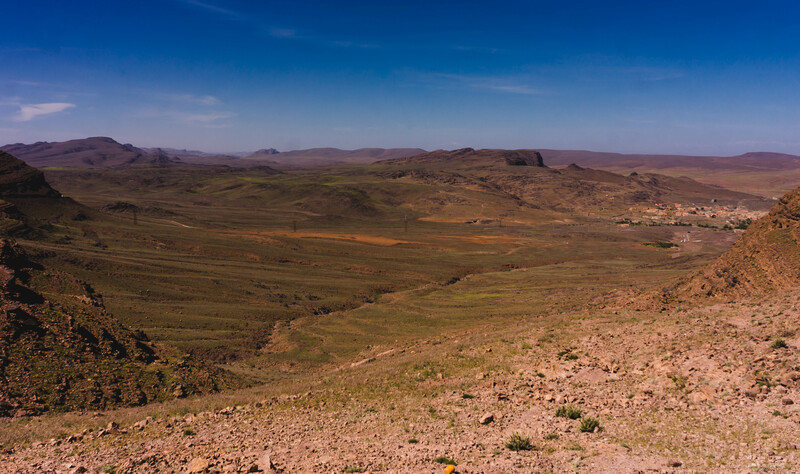 We have quite fallen in love with our hilltop refuge known as Riad Dar Tougha and it is gearing up to be our favourite campsite at least in Morocco if not ever. I know we say that every week. Erkounte Park was like a Las Vegas, brash, modern, clean, organised and we did love it. This is more rustic and full of charm, some say Sidmouth, some say Topsham, you can say wherever you want. We have the complete run of the place as we are the only ones here. We order our shower for 5 and at about 4 the chaps start chopping the wood for the boiler. Food is great. Place is spotless and nothing is too much trouble. We also noticed when we arrived there was free Wifi. We had a quick check and noticed a healthy 2Mb/sec. So, let’s get connected we hooted and get some Midsomer in. We only have 3 Episodes left of Series 7 to watch. I went for Series 8 but was overruled by Tracy who wanted the unseen for us, series 17 downloaded. We paid our £8.99 on iTunes, kicked off the download and went to bed. While making the Tea in bed for Tracy in the morning I thought I would have a crafty look at our Barnaby based bonanza. Oops we had a download failure somewhere in the night. Never mind, I thought as soon as the chaps are up we will get re-connected. Three days later there is still no Internet. Apparently someone used up their pre-paid limit for the month. Not us we said ‘we have our own’. My guess is they will need someone like the masterful Barnaby to crack this case. We might get the old black look from them, but in return we get to look out at these scenes. Tomorrow we plan to drive to the top of the gorge and back. People in the know claim it to be one of the great drives of the world. We will let you know. Despite our best efforts of trying to make our odd shoes alluring to any potential thief we have had no takers. I am beginning to run out of ideas of how to attract the criminal fraternity to our camel sourced slippers. Tracy has suggested dressing them in solar lights but I think the jury is still out on that one. So in the meantime I have taken to wearing them during the day. To accommodate the difficulties in walking in odd shoes I have developed a rather interesting gait. The left leg and foot works as normal but the right foot is pointed at three o’clock and then the leg is lifted in the style of annoyed Bull scraping its hoof before being quickly motioned ground-ward and then dragged to a position in line with the left. We will keep you informed both on the hopeful theft and associated walking style. One month and not counting anymore. Much easier than fags.